From the very beginning of my life as a painter, it has been my aim to be able to express my joys and sorrows through color and line as freely as a child expresses its hunger by crying or its joy through laughter.\" Born in 1947 in Mumbai, Rekha Rao studied art under her father K.K. Hebbar. She fondly remembers him and his ways. \"He was really keen that we join Elphinstone College only because it was right across the Jehangir Art Gallery. Every evening he would ask me, `Did you go to the gallery?\' And I had to bring back every catalogue, tick mark what I liked and he would do the same and then we would discuss what we liked and why." Rao recalls one career-defining instance from this informal education of hers very clearly. She and her father once saw a blind man begging for alms on the street, and decided to use him as a subject in a painting. When her father saw the final piece he noticed the man had no eyes. Rao answered his questions very simply by saying, \"if he can\'t see anyway, what is the need for eyes?\" Rekha Rao always knew that creating abstract art meant that all the non-essentials had to be removed. She has always followed this path in her career, staying at a distance from the figurative, and never straying far from the symbolic. Rao\'s mixed media works, which combine oil and acrylic, unite deep and biding abstraction with almost the opposite - light and sketchy geometric or human and animal forms, which are not at all difficult to overlook. On the whole, the images are held together in meaning and visual appeal by the colors, which are dictated by Rao\'s mood. Pastel shades of somber grays, earthy browns and the green of a stormy sea are juxtaposed with areas of loud reds and bright oranges. Sometimes Rao even resorts to rendering textures on her surface. For this artist, personal expression is the be all and end all of art. Rekha Rao held her first solo exhibition in Mumbai, in 1969. This was followed by several exhibitions both in India and abroad. 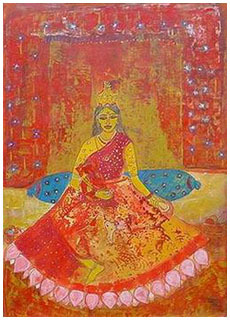 Apart from Mumbai and Delhi, the city of Los Angles and those in Germany and Australia have played host to her paintings. In 1976 and 1977 she received the Hyderabad Art Society\'s Award. 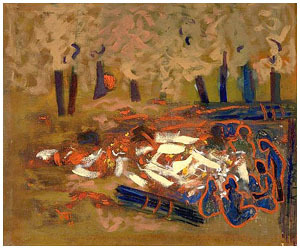 Her works are represented in the permanent collections of the National Gallery of Modern Art, New Delhi, Lalit Kala Akademi, New Delhi, and Singapore National Museum. 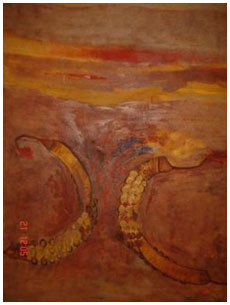 She has also participated in the IV Triennale of India in 1978 and the Asian Biennale, Dhaka in 1986. She received the Critics Award in 1971, the Lalit Kala Akademi Award in 1977 and the Maharashtra State Award in 1978. Jehangir Art Gallery, Mumbai 2001,1996,92,88,85 Renaissance Gallery, Bangalore, 2000 San Tache Art Gallery, Bombay, 2000 Cymroza Art Gallery, 2003, 1995 Sakshi Art Gallery, Chennai & Bangalore 1991,87 Gallery Unverzagt, Germany 1985 Gallery `K’, Geneva & Bonn, sponsored by ICCR, Delhi 1985 Dhoomimal Gallery, Delhi 1993,81 Urja Gallery 1980 Gallery Surya, Germany 1976 Chemould Gallery 1975, 71 Serisawa Gallery, Los Angeles, USA 1972 Workshops: Artists Camp, Chikmagllur, organized by MSIL, 2000 Artists Camp, Sumukha Gallery, Katmandu Nepal 1997 Artists Camp, Goa, organized by LKA Rajasthan 1995 International Artists Camp, Jaipur, organized by LKA New Delhi to coincide with VII Triennials India 1994 Conducted workshops for students, Mohile Parekh Centre for visual Arts, Mumbai 1990 Artists Camp, LKA Regional Centre, Lucknow, 1989 Collections National Gallery of Modern Art, Mumbai Singapore National Museum Lalit Kala Academy, New Delhi Directorate of Art Maharashtra State Venkatappa Art Gallery, Bangalore Many private collections in India & abroad.